NOW WITH Advanced BAFANG Electric POWER!! These bikes are big and Big FUN. Big weighs more. Most average fat bikes weigh between about 30 and 40 pounds. How much do these Electric fat bikes weigh? 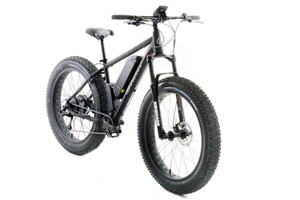 Compare specs, aluminum electric fat bikes with similar parts will weigh the about the same. 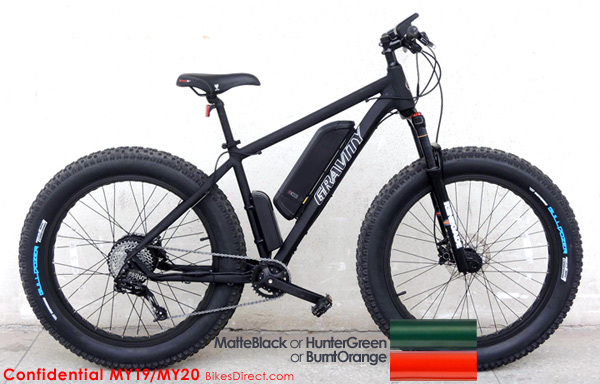 16" fits most 5'6" to 5'10"
18" fits most 5'10" to 6'1"
Gravity eBikes have equal or better specs +lower weight at up to $2200 less than comparable ebikes+ FREEship48. F/HUB : KT-M9CF ALLOY BLACK W/KT204B ALLOY BLACK 150mm THRUAXLEQR. Brakes/Levers BRAKE:	SHIMANO M365 HYDRAULIC DISC BRAKE W/SM-RT56S 160MM ROTOR. EBike DriveTrain REAR MOTOR : BAFANG 750W/RATED VOLTAGE 48V. SPEED SENSOR : BAFANG SR.PA01.12.S. . CONTROLLER : BAFANG CR.S107.1000.SN 48V/SPEED MAX 32km/h.